This article is about Corrin's appearance in Super Smash Bros. Ultimate. For the character in other contexts, see Corrin. For smasher info, see Kamui. Corrin (カムイ, Kamui) is a playable character in Super Smash Bros. Ultimate that was officially confirmed on June 12th, 2018. As in Smash 4, both male and female versions of the character are playable. Corrin is classified as fighter #62. 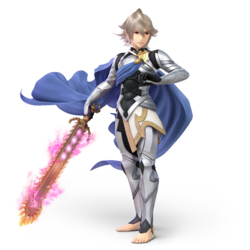 Cam Clarke and Marcella Lentz-Pope reprise their roles in the English version of Ultimate, voicing male and female Corrin respectively, albeit through recycled voice clips from Smash 4. Nobunaga Shimazaki and Satomi Satō also reprise their roles as the male and female Corrin in the Japanese version of the game, also with recycled voice clips from Smash 4. Play VS. matches, with Corrin being the 41st character to be unlocked. Clear Classic Mode with Kirby or any character in his unlock tree, being the sixth character unlocked after Robin. Have Corrin join the player's party in World of Light. With the exception of the third method, Corrin must then be defeated on Coliseum. Considered to be high-tier in Smash 4, Corrin has been noticeably nerfed overall in transition to Ultimate. Dragon Lunge, previously the most versatile move in Corrin's kit and infamous for being one of their most defining traits, has lost a large part of its utility, as both kicks cover less distance and have received a sizable amount of ending lag that leaves them much easier to punish if missed, which is exacerbated by the changes to character pushback (known as jostling) preventing the move from going through shielding opponents, therefore leaving Corrin vulnerable in front of them. Corrin's other notable moves have received various nerfs as well: Dragon Fang Shot has slightly increased lag and paralyzes opponents for a much shorter time if not fully charged; Counter Surge has lost its stronger late hit, deals considerably less knockback, and has much more ending lag upon a successful counterattack; and forward smash, formerly the longest-ranged non-projectile move of its kind, has a shorter hitbox duration and a weaker sweetspot, reducing its KO ability. As a result, Corrin's most potent punish options have been all toned down, while their main neutral tool is drastically more commital. Lastly, Corrin's recovery has been worsened, as their double jump and Draconic Ascent cover less distance. Despite this, Corrin has also received some buffs, though mainly through universal changes. The increased mobility, faster jumpsquats, and reduced landing lag grant Corrin far more combo opportunities, by virtue of possessing a myriad of attacks that launch opponents vertically and can cover wide areas (up tilt, down tilt, and all aerial attacks except back and down aerial). The changes to the paralysis effect allow Dragon Fang Shot to paralyze for slightly longer at high enough percents, and to deal knockback to already paralyzed opponents (rather than only damage). While Dragon Lunge and forward smash have been nerfed overall, both have also received some remarkable buffs; the former can now be canceled manually, granting Corrin an extra option out of it that can serve as a situational mixup, and the latter benefits from the ability to hold smash attacks for longer, allowing it to increase the duration of the looping charge hits and deal higher damage with them. However, unlike most other veterans, Corrin has received few direct buffs, and neither them nor the indirect buffs properly compensate for the more impactful nerfs. Overall, Corrin's nerfs outweigh the buffs, resulting in a worse performance than in Smash 4. Corrin has achieved few notable results in Ultimate's early metagame, due to Corrin's most successful mains in Smash 4, Cosmos, Ryuga, and Zackray, dropping the character, while others have failed to go far in tournaments. This leaves Corrin's true level of viability and how it compares to that of Smash 4 uncertain. As with all veterans returning from SSB4, Corrin's model features a more subdued color scheme. Corrin's high knockback voice clips, previously only heard in SSB4's Sound Test, are now used properly. Corrin has a unique victory theme, based upon Lost in Thoughts All Alone. Like all characters, Corrin's jumpsquat animation now takes 3 frames to complete (down from 6). Corrin runs faster (1.45 → 1.595). Corrin's initial dash speed is faster (1.8 → 1.892). Corrin walks faster (1.15 → 1.208). Corrin's air speed is higher (0.97 → 1.019). Corrin's traction is significantly higher (0.065 → 0.129). Corrin's double jump covers less distance. Forward roll grants more intangibility (frames 4-14 → 4-15) and has less ending lag (FAF 31 → 30). Back roll has more startup (frame 4 → 5) and ending lag (FAF 31 → 35). Back roll grants more intangibility (frames 4-14 → 5-16). Air dodge has more ending lag (FAF 34 → 50). The first hit transitions into the second hit faster (frame 11 → 9), which transitions into the neutral infinite faster (frame 9 → 8). The first and second hits have altered angles and knockback to keep opponents close to Corrin, akin to other neutral attacks. This allows them to connect better and jab lock. The third hit has less ending lag (FAF 36 → 31). The neutral infinite has a shorter gap between hits (5 frames → 4), and deals less hitlag, allowing it to connect more reliably and making it harder to escape. All hits except the second and the neutral infinite's finisher deal less damage (3% → 2.5% (hit 1, tipper), 3.3%/5% → 3%/4% (hit 3), 0.9% → 0.5% (infinite)), with knockback not compensated on the third hit, reducing its KO potential. The third hit has a shorter duration (frames 6-8 → 6-7). The neutral infinite's finisher deals less knockback, reducing its KO potential. The third hit of neutral attack is an outward slash, rather than a stab. The neutral infinite's finisher launches at a lower angle, no longer being the same as the third hit's. Forward tilt has a shorter hitbox duration (frames 8-10 → 8-9). It launches at a noticeably lower angle, more akin to other forward tilts. This removes its juggling potential, and reduces its KO ability from center stage, but improves it more drastically near edges. Dash attack has less ending lag (FAF 56 → 50). It has one frame more startup (frame 11 → 12). It has altered hitbox timings with shorter gaps between hits (frames 11, 14, 17, 20, 23, 26 → 12, 14, 16, 18, 20, 23), and the looping hits deal less hitlag. This allows it to connect more reliably and makes it harder to escape. The ability to hold smash attack charges for two additional seconds benefits forward smash, allowing Corrin to extend the duration of its looping charge hits and thus deal more damage. Forward smash reaches its maximum range on the first active frame, and its hitboxes no longer change with timing (12%/11% (early), 12%/11%/15.2% (clean), 12%/11%/16.5% (late) → 12%/11%/15.2% (all)). This allows it to hit from farther distances earlier, and causes the early sweetspot to come out faster. However, this removes the late sweetspot, and shortens the move's hitbox duration (frames 17-22 → 17-18). This hinders the sweetspot's KO potential, and makes it harder to land. It has slightly increased knockback, improving the sourspots' KO potential. Forward smash has gained a water hit effect. Up smash's sweetspot deals slightly more knockback, improving its KO potential. Down smash has less ending lag (FAF 54 → 49). The back hit's sweetspot deals less knockback, hindering its KO potential. All aerials except down aerial have less landing lag (13 frames → 10 (neutral), 14 frames → 8 (forward), 14 frames → 13 (back), 15 frames → 9 (up)). This noticeably improves Corrin's combo ability overall, due to all but back and down aerial launching opponents vertically. Neutral aerial auto-cancels earlier (frame 50 → 47). Forward aerial has more startup lag (frame 7 → 9). However, its total duration remains unchanged, giving it slightly more combo potential into attacks other than itself in the air. Up aerial auto-cancels earlier (frame 40 → 37), allowing it to auto-cancel in a short hop. All grabs have more ending lag (FAF 31 → 37 (standing), 38 → 45 (dash), 36 → 40 (pivot)). Dash and pivot grab have more startup (frame 8 → 10 (dash), 9 → 11 (pivot)). Corrin has a new pummel, a knee strike. Pummel deals more hitlag (5 frames → 14), but has significantly less startup (frame 16 → 1) and ending lag (FAF 24 → 7), shortening its duration. Forward throw hits and releases the opponent slower (frame 10, 11 → 14, 15), making it easier to DI. However, its total duration remains unchanged, reducing its ending lag. Forward throw can no longer combo into a Dragon Lunge at low percentages due to changes to fast knockback physics. Corrin's back, up and down throw release the opponent one frame faster (frame 14 → 13 (back, up), frame 28 → 27 (down)). However, their total durations remain unchanged, giving them one frame more ending lag. Back throw's tipper deals less knockback, reducing its KO ability against bystanders. Due to the altered paralysis mechanics, Dragon Fang Shot can deal knockback to offstage opponents that have been already paralyzed, improving its edgeguarding ability, and can paralyze opponents for longer at higher percents. A fully charged shot has less base knockback, but more knockback scaling, improving its KO potential. A fully charged bite has more base knockback, allowing it to KO even earlier. Uncharged Dragon Fang Shot has more startup (frame 15 → 17), with its total duration increased as well (FAF 60 → 62). A non-fully charged shot deals less knockback, and paralyzes opponents for a much shorter time. This makes it much harder to follow up on, even into the subsequent bite attack. This is further hindered by the new knockback physics, as opponents are launched faster and experience less hitstun at higher percents. Dragon Lunge's pin can be manually canceled by pressing down on the control stick. While allowing pinned opponents to escape immediately, this leaves Corrin less vulnerable if the move misses. The jump grants more intangibility (frames 2-5 → 2-7). The kick portion has Corrin slant towards the ground during the kick itself, rather than after. This ends up reducing the distance the kick travels, worsening its utility. Both kicks have drastically more ending lag (FAF 46 → 57 (forward), 46 → 61 (back)). The changes to jostle mechanics significantly hinder the safety of the kicks, especially combined with the aforementioned change, as they can no longer go through shielding opponents, making them much easier to punish. The early hit of the back kick deals less knockback. The jump has more ending lag (FAF 44 → 46). Pin canceling now incurs 19 frames of landing lag. Draconic Ascent halts at the end of the move instead of granting slight momentum, reducing its recovery potential. It deals seven hits, down from eight, but the second to sixth hits deal more damage (1% → 1.2%), leaving the total unchanged. Counter Surge has a longer counterattack window (frames 7-24 → 7-26). Its minimum damage has been increased (8% → 10%). It has reduced vertical range, making it less safe against opponents attacking from above. Counter Surge deals less knockback, which compensates for its higher minimum damage if a countered move is weak enough, but drastically reduces its KO ability otherwise. Additionally, it no longer has a late hit with a higher damage multiplier, instead being consistent throughout (1.2×/1.3× → 1.2×). As a result, it is no longer the strongest counterattack in the game without knockback modifications. It has more ending lag both when missed (FAF 64 → 67) and successful (FAF 50 → 67), most significantly in the latter case. This removes its combo potential, hinders the effectiveness of consecutive counters (additionally removing the infinite Counter Surge performed by two Corrins), and causes Corrin to no longer be intangible for the entire duration of a successful counter. Corrin has been buffed via game updates, but only received few noteworthy buffs. Forward smash’s charging loop hits connect better and Dragon Ascent has 3 more invincibility frames, connects better and the last hit deals more knockback. Up aerial auto-cancels earlier (frame 40 → 37), matching the move's interruptibility and allowing it to auto-cancel out of a rising short hop. Forward smash's charging loop hits connect into the attack more reliably. Up smash has a longer duration (frames 13-15 → 13-17) and the sweetspot has more range. Down aerial's looping hits connect more reliably against lightweight characters. Uncharged Dragon Fang Shot travels more distance before disappearing (61 frames → 71). Dragon Lunge has less ending lag after stabbing (FAF 15 → 13). Dragon Ascent grants more intangibility (frames 10-17 → 7-17), its hits connect more reliably and the final hit deals more knockback. 2% (base), 2.5% (tip) A stab with a spear arm, an inward slash with the Omega Yato held in a reverse grip, and an outward slash with the Omega Yato held properly. If the neutral infinite is initiated, Corrin then transforms the spear arm into a draconic mouth with Dragon Fang, which repeatedly bites the opponent. These bites are finished with a final strong bite. 10.5% A downwards outward swipe with the Omega Yato. 9% (clean, late sword), 6% (late body) A twirling-turn upward slash with the Omega Yato. 7.5% Slashes across the ground with the Omega Yato. Relatively low knockback which sends opponents up and slightly towards Corrin, making it a viable combo starter. One of Corrin's fastest attacks. 2% (hits 1-5), 3% (hit 6) Spins forward in a corkscrew-like manner while holding forward the Omega Yato. Based on the attack after triggering offensive skills like Luna or Lethality in Fire Emblem Fates. Dragon Fang Thrust 0.5% (charging loop), 11% (spear base), 12% (spear center), 15.2% (spear tip) Transforms the free arm into a spear with Dragon Fang and thrusts it forward. It possesses immense reach, being the third longest reaching non-projectile forward smash in the game, only behind Simon and Richter's. It can also be angled, making it good for catching opponents trying to return to the stage when angled up or hitting crouching/small opponents when angled down. The sweetspot is at the tip and deals very high knockback, although the rest of the attack is considerably weaker. Has a hitbox while charging, where Corrin holds the Omega Yato in front of them as the chainsaw blades start to move to repeatedly damage opponents in range. Though this does not lead into the sweetspot, it can catch opponents for a fully charged blow. However, the Yato's hitbox is rather easy to SDI out of, as doing so upward can allow the opponent to avoid the main attack with a well-timed air dodge, while doing so towards Corrin will cause enemies to end up behind Corrin if close enough. Based on the second hit of the Dragon Fang skill in Fire Emblem Fates. Vertical Dragon Fang Thrust 10% (sides), 13% (base), 15% (tip) Corrin crosses both arms, crouches, and transforms the arms into Dragon Fang spears, pointing them upward across themself in a bracing position to launch opponents. Has a sweetspot at the tip, but its range is poor and knockback is lacking on the sourspot. Yato Dragon Fang 11% (sword), 9% (lance, middle), 14% (lance, tip) Corrin transforms one leg into a Dragon Fang spear, then stabs in front and behind with the Omega Yato and the Dragon Fang spear, respectively, in a one-legged forward lean stance. Animation is similar to the Mii Brawler's down smash. The tip of Corrin's spear leg has a sweetspot that deals the most damage and knockback. 7% (clean), 5.5% (late) Slashes with the Omega Yato from above to behind, while simultaneously using a Dragon Fang spear to slash forwards. Unlike in Corrin's other moves, the Dragon Fang spear doesn't deal more damage at the tip. It hits all around Corrin, has low landing lag, and launches opponents at a high angle, allowing it to function as a reliable combo starter at a wide range of percents. 7.5% An inward single-handed reaping slash with the Omega Yato. Similar to Marth's, only with Corrin’s legs being positioned differently. It launches at a fairly high angle, autocancels from a short hop, has a wide arching reach, and low ending lag, making it very viable for aerial combos. Dragon Fang Wings 11% (clean), 9% (late) Sprouts wings with the Dragon Fang, and attacks by flapping them. Can be used for recovering as it propels Corrin forward like R.O.B. 's back aerial. It also has good range and knockback, but has the slowest startup out of all of Corrin's aerials. 9% Slashes in the air with the Omega Yato in a backwards flip, closely resembling the up aerials of all the other Fire Emblem characters (sans Ike, who doesn't backflip). Has wide range, quick startup and surprisingly good knockback, making it a go-to vertical KO move and an excellent finisher from Corrin's combos. Dragon's Piercing Drop 2% (loop), 3% (landing) Corrin's legs morph into spears with Dragon Fang, diving downward feet-first. A stall-then-fall drill that meteor smashes weakly with set knockback, excluding the landing hit which deals moderate upwards knockback, both in the air and when landing. However, since Corrin fast-falls during the attack, it is difficult to recover offstage after using it. As a result, it works better when used for a sacrificial KO, or to quickly punish actions air-to-ground. — Leans forward slightly and reaches out with the free hand, which briefly enlarges. 5% (hit 1, base), 10% (hit 1, tip), 2% (throw) Transforms the free arm into a spear with Dragon Fang, and stabs the opponent with it, knocking them up and away. Unusually, even though the scaling of this throw is very low, it possesses a tipper hitbox that can hit bystanders. If tippered, this throw is significantly more powerful, and is thus very deadly if at the edge. 6.5% (hit 1, base), 12% (hit 1, tip), 2% (throw) Places the opponent backwards and stabs them upwards with the Dragon Fang spear-turned arm, knocking them away. Similar to forward throw, though with slightly more damage and knockback, along with possessing a tipper hitbox just like forward throw, but due to the slight differences in damage and knockback, it's considered more powerful than the forward throw in both regards. 6.5% (hit 1), 3% (throw) Lifts the opponent into the air and transforms into dragon form, then raises on its hind legs to launch opponents in the air via a headbutt during the transformation. Afterwards, Corrin reverts back into human form. The strongest out of all of Corrin’s throws. Dragon-Form Kick 6.5% (hit 1), 3% (throw) Throws the opponent to the ground and transforms into dragon form, then roars in anger while proceeding to stomp down on the opponent and emitting a splash of water. Afterwards, Corrin reverts back into human form. 7% Slashes outward from front to back with the Omega Yato. 7% Same as frontal floor attack. 5% Slashes outward with the Omega Yato, covering every possible side. 9% Climbs up the ledge and swings the Omega Yato forward. 20% (bite, fully charged) Corrin transforms the left arm into a draconic mouth with Dragon Fang, and fires a ball of water. The ball of water briefly paralyzes opponents before launching them away. After the projectile is fired, Corrin's dragon arm will bite before reverting to normal, hitting nearby opponents. Holding the special button will charge the projectile (causing more damage and knockback, along with increased paralysis duration), as well as the bite (when fully charged, Corrin clamps down forcefully with the dragon mouth, causing very high damage and knockback). The two attacks can be charged in different intervals from each other (i.e. an uncharged shot followed by a fully charged bite, or vice versa). 12% (front/back kick, clean), 7% (front/back kick, late), 5% (back kick, turn) When used on the ground, Corrin hops a short distance into the air; pressing the attack button during the hop will result in Corrin striking diagonally down with the Dragon Fang spear arm. When used in the air, however, Corrin instantly strikes with the Dragon Fang spear arm. If it hits any terrain during the move (be it the ground or a wall), Corrin's arm will remain there, pinning any opponent caught in place. From there, it can be followed up with either a kick to either side, by pressing the attack button or tilting the control stick horizontally; or a jump by pressing the jump button or tilting the control stick upward. It can also be canceled entirely by tilting the control stick down, or automatically after pinning a surface for two seconds, which can be useful for reading the opponent's floor recovery. However, canceling the move allows the opponent to act out of it immediately. Pinned opponents can also escape by button mashing if Corrin does not choose an action soon enough. Like most of Corrin’s moves, the tip of the spear deals the most damage and knockback. Dragon Ascent 4.5% (hit 1), 1.2% (hits 2-6), 3% (hit 7) Corrin grows wings using the Dragon Fang and leaps upwards. Similar to Roy's Blazer, it hits multiple times, and can be angled by approximately 45°. Additionally, like Rosalina's Launch Star, it can be angled to go as high and vertically as possible by pushing backward immediately after activation (though not too early in order to not accidentally reverse the move instead). Counter Surge 1.2× (minimum 10%) Corrin’s head goes into dragon form while getting into a defensive stance. If attacked, Corrin transforms into a dragon using the Dragon Fang, and slams the ground. A surge of water then erupts from the ground on both sides of Corrin, launching opponents upwards; a unique counter with these distinctions. Torrential Roar 7% (light pillars, base), 2% (light pillars, tips), 34% (whirlpool) Corrin strikes with both hands, creating two large pillars of light. Anyone who gets hit will be transported to a rocky mountain area. Corrin then transforms into a dragon with the Dragon Fang, and unleashes a whirlpool that traps and launches all fighters before going back to the standard stage. Falls gently onto the stage in dragon form, with a pool of water appearing underneath. Corrin then transforms into human form. Side Taunt: Twirls the Omega Yato. Male Corrin says "I've made my choice." (僕は選んだ!, I've made my choice!). Female Corrin says "Your fate is clear." (折れたりしません!, I will not surrender!) Resembles Corrin's animation before a battle in Fire Emblem Fates. Twirls the Omega Yato around forward. Poses with the Omega Yato positioned behind Corrin. Swings the Omega Yato. Male Corrin says "I win!" (勝負あったね, That's game. ), while female Corrin says "Good!" (勝負ありました, That was game.). Twirls the Omega Yato overhead and places it on its tip, similar to Corrin's down taunt. Male Corrin says "That went well!" (上手くいったね, That went well. ), while female Corrin says "That was great." (上手くいきました, That went well.). Resembles Corrin's animation after a battle in Fire Emblem Fates. Corrin crosses both arms, then morphs into dragon form while emitting a flourish of water, roaring to the skies. A flourished remix of a small excerpt of Lost in Thoughts All Alone from Fire Emblem Fates. As the name suggests, Corrin's opponents are all in either white or black alternate costumes, referencing Corrin's struggle in choosing between Nohr and Hoshido. Of note is that whenever Corrin encounters themself in their Classic Mode Route, the white costume of the opposite gender will be used. 3 Corrin , Daisy , and Palutena Mario Galaxy Fated Battle Peach and Rosalina & Luma are CPU allies. 4 Pit and Dark Pit Reset Bomb Forest Boss Fight 1 - Kid Icarus: Uprising A female Corrin is a CPU ally, and if you play as a female Corrin , A male Corrin will appear as a CPU ally instead. 6 Corrin , Lucina , and Robin Castle Siege Lost in Thoughts All Alone Marth and Chrom are CPU allies. Although neither gender of Corrin appears in the World of Light opening cutscene, they were vaporized and later imprisoned alongside the rest of the fighters (sans Kirby) when Galeem unleashed his beams of light. Male Corrin was one of the many fighters that fell under Dharkon's control upon Galeem's first defeat. He is on a platform made of clouds in the Mysterious Dimension sub-area, guarded by the spirit of Azura (whose spirit battle ironically is against the default Female Corrin). Corrin's Fighter Spirits can be obtained by completing Classic Mode. They are also available periodically for purchase in the shop for 500 coins. Unlocking Corrin in World of Light allows the player to preview the first spirit below in the Spirit List under the name "???". As Fighter Spirits, they cannot be used in Spirit Battles and are purely aesthetic. Each Fighter Spirit has an alternate version that replaces them with their artwork in Ultimate. •The enemy starts the battle with an enhanced Beam Sword Still, Move Forward! Male Corrin idling on Suzaku Castle. Male Corrin using his neutral attack's first hit on Mario Galaxy. Female Corrin performing her forward throw on Little Mac on Kalos Pokémon League. Male and female Corrins on the Great Plateau Tower. Female Corrin wearing the Bunny Hood on Luigi's Mansion. Corrin is the only character who, in the mural for Classic Mode, is represented by one of their alternate costumes: the default female Corrin. This also makes Corrin the only character with a gendered alternate to be represented by the alternate costume. Additionally, while most characters exclusively use their default costumes for promotional material, Corrin is a notable exception, as both genders receive near equal representation in promotional material, both advertisements and in-game (such as in the opening movie or rules images). These oddities are likely due to Corrin being advertised more often as female outside of Smash, such as in Fire Emblem Cipher, Fire Emblem Heroes, and most notably Fire Emblem Warriors. Corrin is one of the few fighters whose Star KO spins forwards instead of away from the screen, similarly to how Star KOs acted in Smash 4. Corrin shares this trait with Cloud, Shulk, Incineroar and Inkling. Corrin can be unlocked by clearing Classic Mode as Robin, likely referencing that they are both avatar characters in their respective Fire Emblem games. While other characters with two selectable genders (Pokémon Trainer, Inkling, Wii Fit Trainer, Robin and the Mii Fighters) have two identical Announcer calls in the English Sound Test (presumably as placeholders for languages with gender-specific pronouns), Corrin is notably the only one who lacks this trait. This is likely due to actually having a name rather than a gender-neutral description in English. While Robin technically has an official name, there are three different names between languages (Robin, Daraen, and Reflet), though, like Corrin, there is no gender separator. 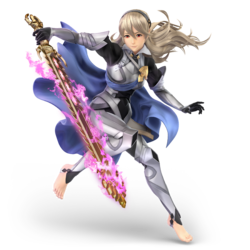 While the default male Corrin is never used in any spirit battles, the default female Corrin is. This technically makes her one of the five characters to use a “default” costume in spirit battles, the others being Yoshi, Mr. Game & Watch, Bowser Jr., Inkling, Robin, Joker and Alph, although Alph and female Corrin are merely alternate characters using their “default” colors. This page was last edited on April 21, 2019, at 22:58.